EXCLUSIVE: Don Mohler uses his executive power to mandate rate increases through mid-2023. “The lack of transparency is outrageous,” says a property owners’ group. The water rate hike announced by Baltimore County last week is the first of five yearly rate increases that will increase the average homeowner’s bill by about 40%, The Brew has learned. In an executive order signed on July 1, County Executive Don Mohler not only hiked existing water and sewer rates by 13.9%, but established a timetable of rate increases through June 2023. Previous water rate increases by the county covered only one-year periods, as was customary in Baltimore City until former Mayor Stephanie Rawlings-Blake, in her final months in office, enacted a three-year 30% hike for city residents in 2016. Mohler’s order will increase water rates 10% and sewer rates 3% each year through fiscal 2023 on top of the 13.9% hike instituted on Sunday. “The lack of transparency is outrageous” – Adam Skolnik, Maryland Multi-Housing Association. The new timetable, which would level off to approximately 6% increases a year, means that a family that paid $1,000 for the county’s water and sewage service last year will pay roughly $1,400 for the same service in 2023. The above figures involve the charges set by the Metropolitan District, a county-operated water and sewer system. County property owners also pay a quarterly water usage charge to Baltimore City, which draws water from county reservoirs, treats it, and then returns it to county residents. Under an agreement finalized last week between the city and county, those quarterly bills rose 6% beginning on July 1. The net effect is that, at least in the short term, water bills are rising at a more rapid pace in Baltimore County than in the city. The opening statement of the July 1 executive order that gave Don Mohler the power to decide water and sewer rates for county residents and businesses. The 13.9% rate increase was made “without any public input or Council oversight,” the Maryland Multi-Housing Association, which represents 70,000 apartment units in the county, stated in a press release. Skolnik told The Brew that the group has been trying to get answers to basic questions about how the county determined the latest rate hike. Skolnik said he was unaware that – as part of his July 1 executive order – Mohler had instituted a five-year plan for rate hikes. A copy of the order was requested and reviewed by The Brew. The series of increases are aimed at shoring up the Metropolitan District Fund, which maintains 2,100 miles of water lines and 3,150 miles of sewer pipes that connect to the Baltimore City system. Without a rate increase, the district faced a $33 million operating deficit based on last year’s revenues, according to county spokesperson Ellen Kobler. The 13.9% rate increase will bring in over $38 million in new revenues, according to Kobler, who said the District’s FY19 operating and capital budgets have not yet been publicly posted. Mohler’s executive order cites a 2005 consent decree between the county and the Environmental Protection Agency (EPA) as a major contributor to the rate increases. The District’s operating and capital budgets have not yet been publicly posted. The county is set to construct a new water filtration plant at Fullerton and faces over $200 million of capital costs to modernize the Back River and Patapsco wastewater treatment plants that – operated by Baltimore’s Department of Public Works – handle the county’s sewage. Kobler said the county has invested nearly $1.8 billion in water and sewage improvements since 2011. 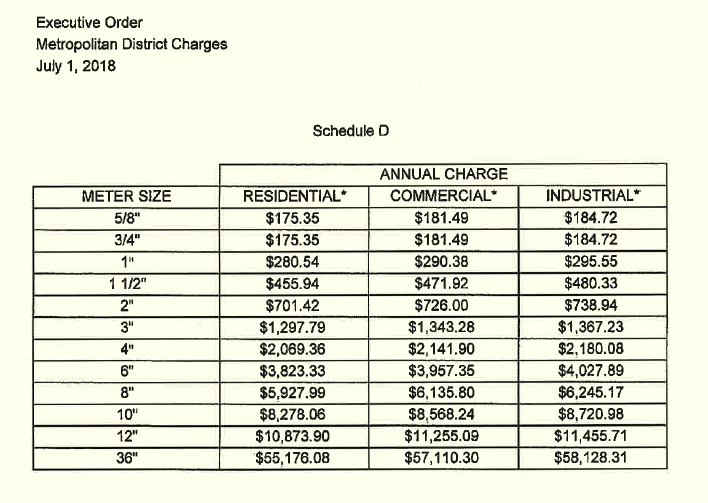 Schedule of FY19 water service charges for property owners based on meter size (most residences have 5/8″ meters). 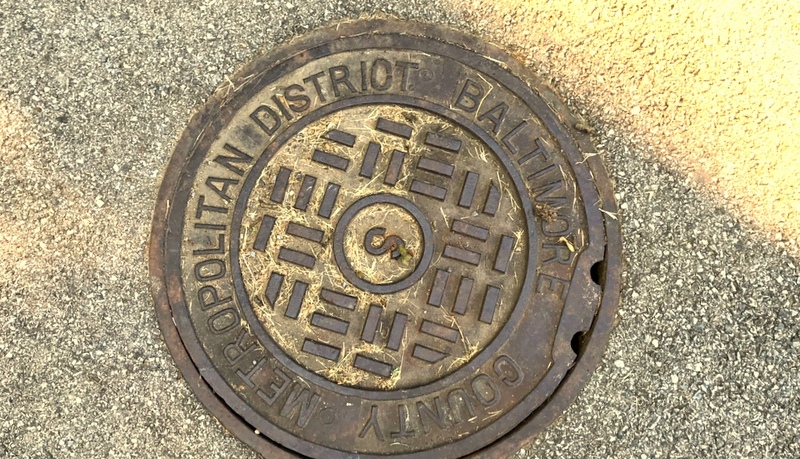 Baltimore County residents pay two other fees: a Metropolitan District sewer charge, which appears on their annual property tax bill, and a water usage or “delivery” charge, paid quarterly to Baltimore City. 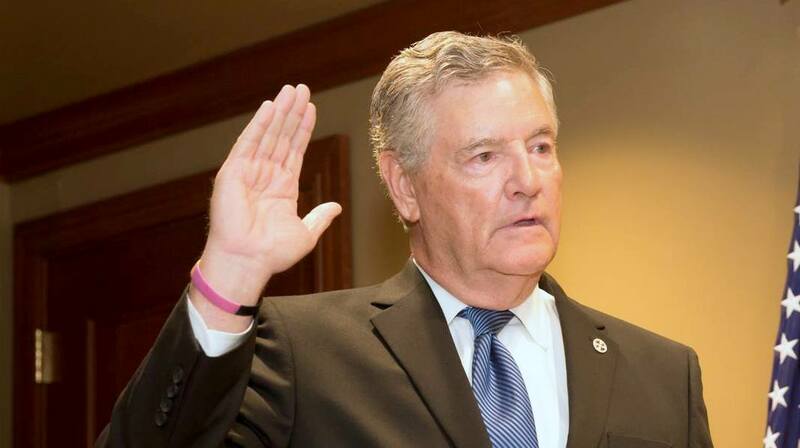 To ease the burden of the rate increases he has imposed, Mohler has instituted a credit program in which county residents with houses assessed at $250,000 or less may have their water and sewer rate increase capped at $100 a year above the previous year. Apartment dwellers, commercial businesses and industrial users do not qualify for the credit program, according to the executive order. Neither do new water or sewage property accounts, properties that have changed hands, accounts that have received an adjustment on their city water bill, and accounts with a minimum sewer charge on their 2017 property tax bill.